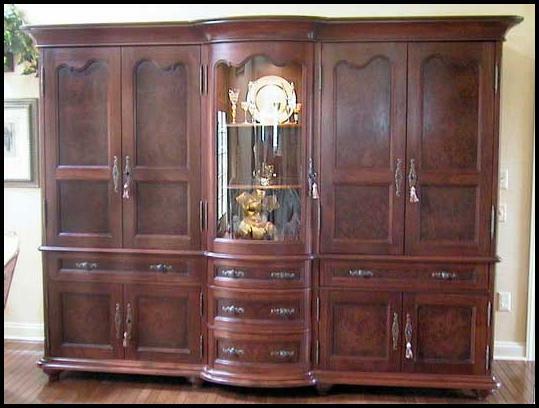 The armoire pictured above and below are made of walnut with walnut burl veneers. The hardware is patinated iron. The left hand upper cabinet in the picture above houses a large screen TV behind retracting pocket doors. Stereo equipment is housed in the lower cabinets. CDs and video tapes are stored in the top drawers. The center display shelves have glass panels that allow light to reach the lower shelves. A 3 way dimmer is controlled by touching the upper hinge. The designer who had requested the first unit was so pleased that she sold a 2nd one to another client. 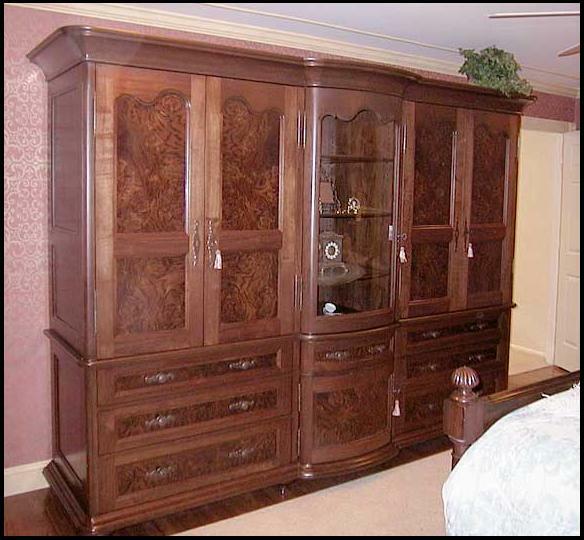 This armoire in the lower picture is in a master bedroom and is used for clothing storage. Closet rods are in the upper side cases. Both pieces measure approximately 9 feet long and 7 1/2 feet high.